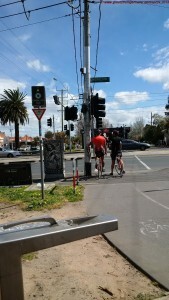 183 – this is the number of riders going past the author today during the brisk 35-minute walk on a little less than 4K of Melbourne’s Capital City Trail. 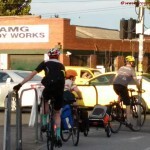 … and the City of Melbourne has installed some very simple and cheap means of making riding (and stopping at the few traffic lights that have to be passed) very convenient: Two bars, one high, one low, to hold on to and/or rest one’s foot on while waiting for the signal. Simple, but immensely welcome and effective. No wonder there are even counting devices installed – no human being could keep up with the buzz and whizz of bike commuters going by in the mornings. A few days ago, on a very nice and warm sunny morning, over 800 bikers had passed the counting site prior to 8.10am, when the blogger pedaled by. And 12 hours later, the count was well over 3,200 riders in that rather residential area. 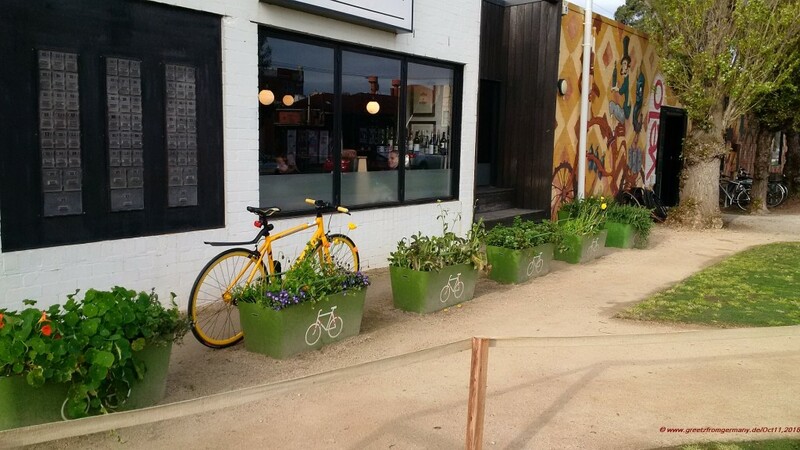 Another nice and simple idea: If the Melbourne rider stops for a bit longer than just waiting for the traffic light to change, there are very out-of-the-box ideas of what to chain your bike to – like these flower beds cemented to the ground and equipped with two bars for running your padlock around. 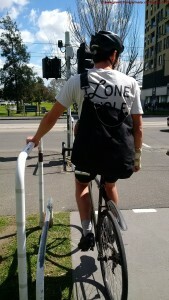 Tomorrow will be bike-to-work day (and the blogger can bike again, too). 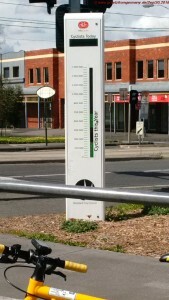 We’ll see if the meter will hit the 4,000-riders/day mark. On bike-to-work day, coffee and snacks will be provided along the most popular bike paths. On every other day of the year, water fountains to quench the riders‘ thirst are installed every few kilometers.